Do Not Fear. Just Believe! 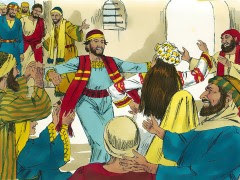 There was a wedding celebration in the village of Cana in Galilee. It was a big feast, and many guests came. All of Jesus’ family were at the wedding. 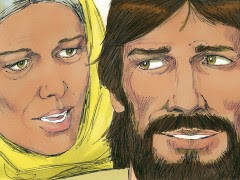 The wedding was closely relatives to the Jesus’ family. Jesus disciples were also invited to the celebration. The wedding celebration place was full of people. 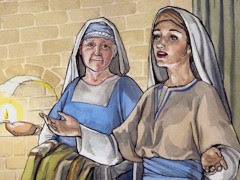 Mary, Jesus’ mother, was deeply involved with the wedding. She planned for the wedding by carefully estimating how many people would come and how much food would be needed to feed them. She prepared enough food for the wedding. However, the wedding celebration was attended by more people than excepted, and the celebration went on. The guest at the wedding were fully of joy. They were talking and laughing while eating and enjoying food. The celebration went on, and nobody wanted to leave. It was a truly blessed wedding celebration. Suddenly everything came together. Then, all gone were her worry and fear of the world (i.e., the wine running out), and her anxiety of not being able to do anything for the servants although the servants kept looking at her carefully. She realized that she was freed from the worry, fear, and anxiety. She knew what to do. She put her complete trust on Jesus, and released all her burden. Then she carefully watched over the lips of Jesus and waited. Mary was surprised. The answer was not what she expected. Jesus was somewhat indifferent of her real worry and concern. She puzzled at first, and then thought about two choices. First, she just gave in and did nothing. Then, the wedding celebration would soon be over. She could just go back to her seat, and collapse while just painfully watching the wedding celebration was quickly dismantling. Second, she continued believing Jesus as the Lord and Savior. What would you do, if you were Mary? She believed Jesus without any doubts. She put everything before Jesus, and she also asked the servants to believe as much as she believed. They saw the unmovable faith of Mary, and they also believe. Standing nearby were six stone water jars, used for Jewish ceremonial washing. Each could hold twenty to thirty gallons. Thus, the jars could hold together 120 to 180 gallons of water, which means 450 to 680 liters of water. The celebration place must have been a big place. If not, why did they have that many ceremonial washing jars? The water levels of the six jars were all different. Some of them were almost full, some half-full, and some almost empty. 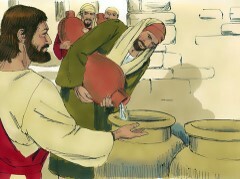 Per Jesus’ instruction, the servants started to pour in water to the jars. It took many trips from the well and to the jars. 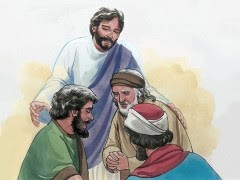 However, the servants quitely and patiently followed the Jesus’ instruction. They filled up the jars one by one. By the way, the servants did not know why they had to fill up the jars, not just one, but all of the six jars. The guests were already in the celebration place. There was no more need to use the washing water. The guests already did the ritual of cleansing when they came in. For them, it was completely absurd adding more water in the jars because nobody would use the washing water any more that night. Even so, they obeyed. Yes, following Jesus is like pouring water in to the jars although we know that certainly nobody would use the water anymore. However, the important message here is to obey Jesus and do what Jesus asks us to do as the servants did. The servants heard Jesus. Then they looked at each other and questioned, “now just draw the water from the jars, and give to the master of ceremonies?” They knew the wedding celebration needed wine, not the water from the ceremonial jars. Although the water in the jars were clean, but it was not for drinking. They could not believe what was told. They thought about what the master of ceremonies would tell them when the master of ceremonies realized that they just brought the ceremonial washing water to him to taste. Doing so was clearly out of mind. They could not know what to do. They scanned with their eyes to find Mary. Then they carefully watched Mary and especially her eyes, and waited her answer. Despite of this absurdity, Mary’s face was still in peace. She nodded as her approval. They knew what to do, when they saw Mary’s steadfast faith. Without any further reservation, they quickly drew the water and brought to the master of ceremonies. One person’s absolute faith is often contagious while making others to have the same faith of the one person, as Mary did to the servant. The master of ceremonies tasted the best wine ever, which was the water in the ceremonial jars. This was what God did. The water in the jars was not potable, but washing only. However, the undrinkable water was turned into the best wine ever. For God, nothing is impossible. God uses something useless, rejected, or completely failed in order to build up His kingdom on earth. Who could have ever imagined at the wedding celebration that the ceremonial washing water would become the best wine ever? Just fix eyes on Jesus Christ regardless what’s going on in our lives. Through our faith, Jesus turns our lives to His masterpiece for His kingdom. The master of ceremonies did not know. The bridegroom did not. The guests did not know. Only knew the servants and Mary. The master praised the wine in view of the earthly wisdom – serving the best first and the worse later. God provided the best, not any wine that could be served at the end of a party when people get drunk, when Mary and the servants had a true faith in Him. God is merciful and gracious to those who keep believing without any doubts. What was the secret of unlocking the miracle of the Cana’s wedding? Faith. Mary recognized Jesus was the Lord, and Mary believed. The servants believed also. Then they obeyed. Faith and obey. This is the secret that God wants from all of us. 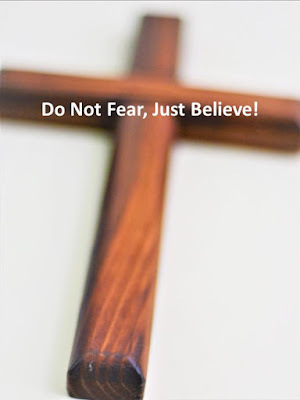 Faith and obey, which truly please Our God, Our Ever-Loving Father. Jesus was the light for the people in the area of Galilee as well as the people in the rest of Judea. In fact, He was and is the true light for the world. This is our hope and faith, and the greatest blessing from God. John the Baptist told about the light so that everyone might believe because of his testimony. Yes, John himself was not the light; he was simply a witness to tell about the light. The one who is the true light, who gives light to everyone, was coming into the world. Yes, Jesus Christ was the one, the Messiah, for whom the people in Judea were waited and waited. The life under the Roman occupation was very harsh and difficulty. Only was their comfort waiting for the Messiah who would liberate them from the Roman occupation. All persecutions would cease, and peace and freedom would come. It was their dream. God wants a single-minded follower of Jesus, who is not distracted by the world. One who can set aside all things for the Kingdome of God. Such followers can truly please God. After all, this is the true wisdom because the world is transient, and His Kingdom is eternal. Jesus traveled throughout the region of Galilee, teaching in the synagogues and announcing the Good News about the Kingdom. And he healed every kind of disease and illness. News about him spread as far as Syria, and people soon began bringing to him all who were sick. 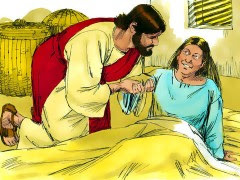 And whatever their sickness or disease, or if they were demon possessed or epileptic or paralyzed—he healed them all. 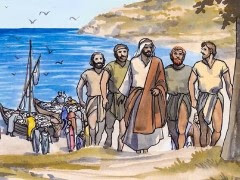 Large crowds followed him wherever he went—people from Galilee, the Ten Towns, Jerusalem, from all over Judea, and from east of the Jordan River. God’s message was given to the people, and God’s miracles came to them through Jesus. More and more people came to Jesus, where they could hear God’s message and healing. 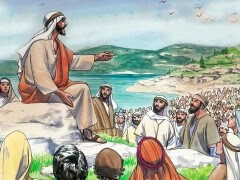 One day as Jesus saw the crowds gathering, He went up on the mountainside and sat down. His disciples gathered around Him. He saw the hardship of the people and their pains. All were in need of God’s mercy, grace, peace and love. The above message of Jesus is known as “Beatitudes of the Sermon on the Mount.” This was not the message for the rich or the powerful, but the poor. It was also for those who mourned, for the meek, for the pure in heart, for the peacemaker, and for those who were persecuted. Later day, Jesus told His disciples and the crowd, “What did you go out into the wilderness to see? A reed swayed by the wind? If not, what did you go out to see? A man dressed in fine clothes? No, those who wear fine clothes are in kings’ palaces. Then what did you go out to see? A prophet? Yes, I tell you, and more than a prophet.” He talked about John the Baptist, and he lamented before the proud who were deaf and blind the truth in their unrepenting hearts. For them, there was no room at all. His message could be not seeded and grow because of their riches in their hearts without hunger and thirst of the Messiah. Their hearts were filled with the world and satisfied by the pleasures in it. The people gathered around Jesus were completely opposite. Their hearts were poor and open, and they were thirsty in hunger for mercy and righteousness, because their lives on earth were harshly and painful. Jesus was different. He stood right besides with those who mourned, and comfort them. Nobody could refuse His comfort, which was beyond of earth, because it was of heaven. Differing from the proud and the powerful, the people gathered around Jesus were the meek with humble hearts. They saw all they had were taken away by the Romans throuth the hands of the greedy tax collectors. Jesus blessed them and promised for them to inherit the earth. We often see the riches of the powerful and the greedy would not last even on earth. After all, all riches are like flowers, which bloom but soon wither. The true rich are God’s blessings in our heart. The meekest in our human history was Jesus Christ who sacrificed His own life for others. Although He was the meekest, He received all the glory and power of world as well as heaven. The Roman empire was so strong and invincible, but it knelt before the meekest of all, Our Savior, Jesus Christ. The true power came from the meekest, Jesus Christ. Thus, we are encouraged and be comforted by being the meek. We will inherit the earth in Him with Jesus as co-heirs and the heaven. Many of them in the crowd hungered and thirsted for righteousness because there were ill-treated. They were persecuted by both the foreign occupiers and their own people who worked for the Romans. No place to go tell their heartbreaks because nobody was willing to hear their heartbreaks and do something for them. All were in fear without peace, but Jesus spoke peace and comfort and poured God’s love in their hearts. Then Jesus did not stop there. Jesus told the next step. Not just enduring the hardships, but Jesus taught for them to be merciful and pure in heart while actively pursuing peace making. Receiving mercy from God is a just beginning. None gathered around Jesus was not worthy to received God’s grace and blessings, but Jesus poured out God’s mercy unconditionally regardless the worthiness of the recipients. This is the secret of God’s mercy. Showing mercy to others who do not deserve is a true mercy, which God wants. Jesus gently taught the people gathered around Him about this secret of a true mercy of GOd. God is always with us. God also knows our weakness. We are easily getting blind by the world. Getting friend of this world is the first step getting blind from the Truth. Then what can we do? We need to fix our eyes on Jesus Christ on cross, and run our own race given to each of us. This pleases God, and our eyes continue open to see God and understand His will. One of the greatest temptations is to be even – eye to eye and tooth to tooth. This is our nature. Jesus asked for us to pray to God for us to be delivered from this strong power of the temptation and evil, because we cannot overcome by our own strength. Only is it possible by the power of the Holy Spirit. God is merciful, and so are we in the power of the Holy Spirit. This is the trait of children of God. The people of the world seek in us. Finally, who will have the kingdom of heaven? Those who are the poor in spirit. One who are rich in hearts with the world will not inherit the kingdom of heaven because their hearts are already filled with the world. No room left for the Word of God to be planted and to grow in their hearts. One who are poor in heart have room to receive the Word of God and rejoice in the Word so that the Word be seeded and grow toward the kingdom of heaven. By the way, if we follow the footsteps of Jesus Christ, the world will like us and persecute us, not because of our own righteousness, but because of His righteousness. Inherently, the world does not like those who belong to the kingdom of heaven. Conflicts between two kingdoms are expected. On earth, the world flex its muscle to persecute the believers being united with our enemy, Satan, who is truly zealous about us, because we are His children. Both attack us, and take us to the spiritual battle, but we do not fear because our victory in Him is sure. Therefore, this is our faith in Him. Then what we can say? We should not be discouraged or dismayed, when we are persecuted for His righteousness because we know His kingdom is ours. We are His lawful heirs and His legitimate children that nobody cannot take away. Therefore joyfully we can say, in Him, let’s stand firm on our faith, and be comforted by His grace, mercy and love under all circumstances in this world. Come Now. I Will Make You As White As Snow. God’s love never changes. God patiently waits for us, as a father who is eagerly wanting for his prodigal son’s return, who took the half of his wealth, left his house, and squandered it. When he saw his prodigal son from distance, he ran to his son and hugged. He saw his son being suffered a lot since exhausting all the money taken from the father in hungry because nobody gave him food to eat. 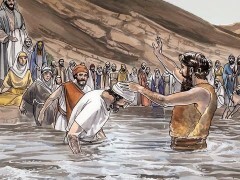 A severe drought came to the land where the son went. There was no place but returning to the father’s house. 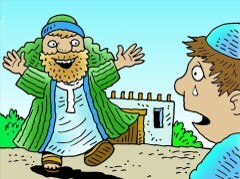 As soon as the father saw his son returning, the father rejoiced because he found again his lost son years ago. The father’s long wait finally ended, and the prodigal son returned to his father’s bosom. 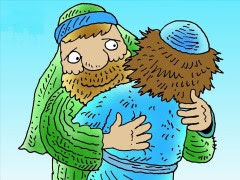 The parable of the prodigal son and his loving father reflects the true secret of the love of our God, our Ever-Loving Father. 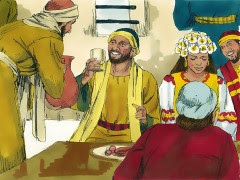 In extreme joy, the father held a feast while inviting his friends and relatives because he had found his son again. 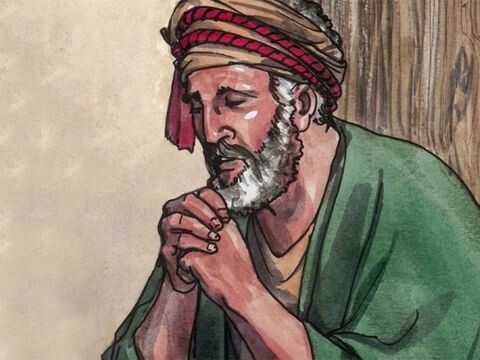 The fact that the prodigal son squandered the half of his wealth did not matter at all. The son who left the father by his own desire finally realized the reality, and humbly returned to the father. The father was truly in joy because of the unconditional love of his son. The father himself was also greatly suffered every night because his beloved son left him. The father’s suffering also ended by the returning of his son. Like the father who waited for his prodigal son day and night. Even at this very moment, our God is waiting for us with His unfailing love. What’s the reason? Because God is love. God truly wants share His unfailing love with us, but the barrier of our sins blocks His blessings and grace. Every day, God patiently waits for us to tear down the barrier. How to tearing down the barrier? Confessing our sins with all our hearts and minds to God and acknowledge with our own mouth to God. Then God, who is faithful and full of mercy and love, is more than willing to forgive our sins. As soon as the barrier disappears, God blessings starts flowing from Him to us through His love and mercy. This is what God exactly wants. That is, He wants to restore our loving relationship with God, which was once lost. Surely we might feel like the prodigal son, who was in shame of squandering all good things of his father. Please remember that it did not matter to the father because he found his lost son. Yes, to God, once we were lost, but we are found now after the long waiting for us. God always desires for us to have His blessings in Him, by Him and for Him. In fact, He is one and only one source of our blessings: His grace, mercy and love. If any of us are still holding of our sins in our heart, then we are blocking all good things from Him. It is time to carefully and humbly search for our sins, which are often hidden from our plain sight because we are easily of the world. Then put out all our sins including hidden sins before God one by one while asking for His mercy and forgiveness. God hears our prayer of His mercy and forgiveness, and surely answers by lovingly touching the deep pain scared by our sins in our hearts, and healing one by one by mending the tears and the pains in our hearts. The frozen blockages in our hearts caused by the terrible sins start melting when warm spring comes. His love starts flowing again in our heart, and changing the barren land to a fruitful land flowing the love of God. God starts rejoicing in us, and again His true desire shares the richness of His mercy, grace and love. Our loving God finally comes deep into our lives again. We continue to bring Him into the center of our hearts as our true King so that He reign us again. God starts demolishing the stubbornness in our heart, which used to be hardened by our ego, pride, greed and sins. All self-centered shames and ugliness are clearly exposed before the purity of Our God’s light, and His light gives a new teaching in us. As we truly receives, our hearts are being transformed. The barren land is transformed to a land of fertility with good soils for the seeds of God’s Word. Even the ugliest part of our heart turns into a shiny piece of the precious of reflecting His glory and goodness. The sins used to reign over us no more because they become powerless before the pure light of God because our hearts are washed away by the blood of Jesus Christ. It is our sure that the One who started good works in our lives will complete. The wilderness of our hearts will becomes a fertile land, and the barren land will be fruitful. Suddenly, our heart are filled with goodness of God. Even we start to produce good things in God. Although the seeds planted by God is so small and tiny like a mustard seed barely visible, the seeds grow big like the mustard plants where birds in the air perches on the branches. As growing, we continuously enjoy the presence of God, Our Ever-Loving Father, who resides in our hearts. Our hearts are blessed by God without ceasing, as trees planted by streams of water, which yield fruit bountifully throughout its season. As the good things from the above constantly fills our hearts, and our hearts produces fruit without ceasing. What a blessing! Our hearts are filled with the good things from above: love, joy, peace, patience, kindness, goodness, faithfulness, gentleness, and self-control. The fruit of our hearts is so bountiful that it cannot be contained only in our hearts. It surely overflows from our hearts. Plainly visible are the fruit oozed out of our hearts. By the way, the source of bearing the fruit is not of our own might and strength in our heart, but the Holy Spirit dwelling in us. Let’s not forget: the power of this world is formidable. There was no one, even one single person who could overcome the world by his/her own might. The greatest king of all kings ever lived on earth was King David. Although he pleased God with his faith, he was at the same time the greatest sinner among those whom we ever know. He took his own officer’s wife, and he killed her husband to cover up. His cunning plan and precise execution successfully made her husband killed at the battle field. Then David joyfully took in Bathsheba to his palace, but God saw this terrible evil acts from the beginning. God sent His prophet, and exposed the David’s terrible sin. Without any hesitation, David fully confessed his sins to God. God saw David’s humility and his repenting heart. God restored David as His king. In fact, during the course of David’s sinning, God never stopped loving David. To God, David was the precious of His love. 1. Nobody is stronger than the power of sin. We will all surely fail, if we rely on our might and strength to fight against sins. Our defeat is sure before the power of sins. 2. God is love, and is patiently waiting for us to come back to Him. We feel shame and guilt dwelling in our hearts due to our sins, but God never gives up on us. His patience is limitless, and His love is bigger than anything else that we can ever imagine. The robber on the cross asked Jesus His mercy, and received the mercy of forgiveness. It is not too late for anyone to receive His mercy. God is always waiting with His open arms to embrace us and to put us in His ever-loving bosom.